Chris Froome is on his way up after a crash in the Tour of Romandy put his Giro d’Italia participation in doubt. Yesterday, the 24-year-old of Team Sky formed part of a day-long escape in the stage to Monte Terminillo. The escape is a move in the right direction for Froome, who not only crashed in Romandy, but also fell sick during the classics. Now, he hopes to continue helping team leader Bradley Wiggins as the race makes its way to the high mountains. “To be honest, I had a tough time coming into the Giro, I got sick just before the classics and then I got sick again after them. 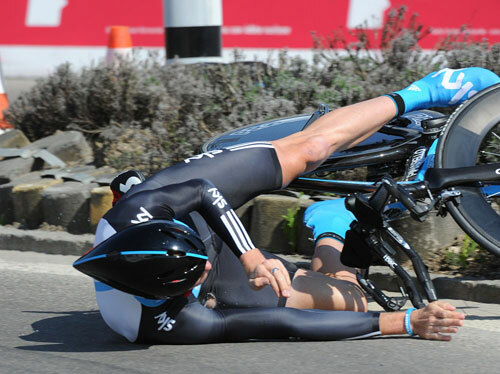 The crash also compromised my training quite a bit,” Froome told Cycling Weekly. His form has improved enough that Sky’s sports director, Sean Yates, sent Froome in an escape group yesterday. Froome and team-mate Steve Cummings formed part of a 17-man group, with eventual stage winner Chris Anker Sørensen. Sørensen attacked from the escape with 10 kilometres to race. Froome and Cummings drifted back to Wiggins’ group, but it was a positive day for Froome. “It was quite evident during the race that Astana would let a move go to the finish if there was not a GC rider in it. It was important to have someone there so we would not be on the back foot, chasing. Wiggins and Sky are at the Giro d’Italia to win, but above all to prepare for the Tour de France. The high mountains of the third week will be the ultimate test for Wiggins ahead of the Tour de France, and Froome feels ready. Depending on his performance, Froome may have a chance to race his second Tour de France. The nine-man team will be selected in June. Froome previously raced the Tour de France in 2008.